Oakland's Geronimo Berroa went down in early August and Jim Bowie got his chance, this would be his major league debut. Called up by the Athletics, Bowie stayed up for the rest of the season. Unfortunately for Bowie, the rest of the season meant appearances in six games, including the season finale, Aug. 11. The 1994 strike came, ending the season for Bowie and the rest of the major league players. Those six games - he got to swing the bat in five of them - would be the extent of Bowie's major league career. Bowie made the majors in his ninth season of professional ball. He began, taken in the 12th round out of Louisiana State by the Mariners in the 1986 draft. He began at short-season Bellingham, where he hit .277 with five home runs. A reporter for the Eugene Register-Guard played on Bowie's name while reporting on one July game. Bowie, the reporter wrote, "provided the most unkind cuts of all - three hits, two RBI and two runs scored." The Register-Guard also noted a Bowie relative, not the knife's namesake, but Sam Bowie, the basketball draft pick known for being the guy taken ahead of Michael Jordan. Sam Bowie was Jim Bowie's cousin. Jim Bowie went on to make AA Williamsport in 1989, playing most of the year at AAA Calgary. He returned to Williamsport for 1990. He didn't return to AAA full time until 1994, with the Oakland system. He'd joined the Athletics as a free agent the previous year. 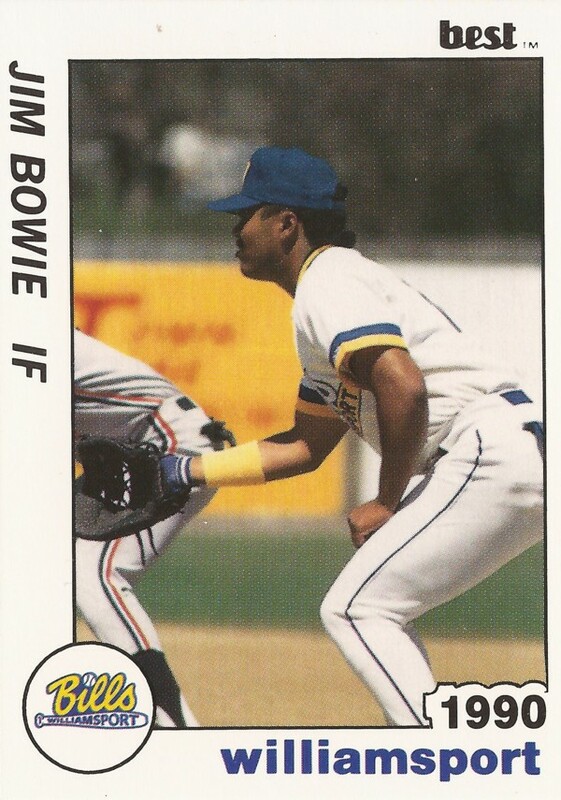 After his brief stint with Oakland that August, Bowie returned to AAA in 1995, his last year as a full-time player. In 1997, he served as a coach and player for AA Mobile, his last year in the field. 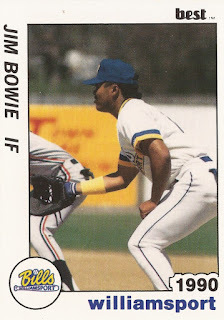 Bowie went on to a career as a hitting coach and a minor league coordinator. From 2005 to 2008, Bowie served as hitting coach for AAA Fresno, coaching Eugenio Velez in 2008. Velez had gotten into a slump earlier that year, but came out of it. He credited Bowie, according to MLB.com. "The hitting coach (Jim Bowie) told me, 'If you keep swinging the bat, everything's going to be fine," Velez told MLB.com. "When you go to the plate, don't think. If you see something white, just swing (at) it."